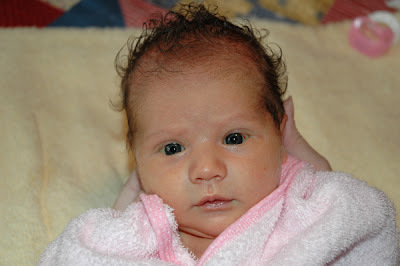 As promised in yesterday's post, here are some more post-bath pictures of Ava. 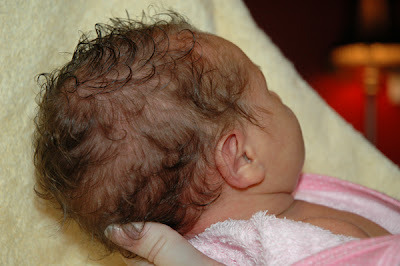 We've noticed that when we wash Ava's hair it gets a little curly. If you comb it out while it's still wet it will go straight; otherwise the curls stay in. After getting dried off, we dressed her in her pajamas (no she doesn't wear the headband to bed, but it makes for a cute picture). We have found that she likes to relax with her arms raised to either side of her head. In fact, she typically falls asleep in this position. Woah! 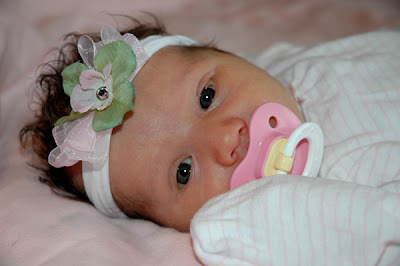 That baby is the cutest of cute babies! There are cute babies here in KZ, but not like that little Ava baby. How many times can I say "baby" in one comment, you ask? Hey, I think we have another Betsy in the making here. 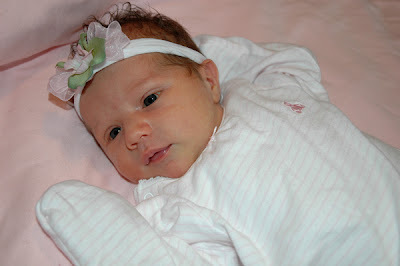 If she turns out like her aunt, you will have one darling daughter! Granny O.